In need of some show stealing Christmas Centerpieces this year? 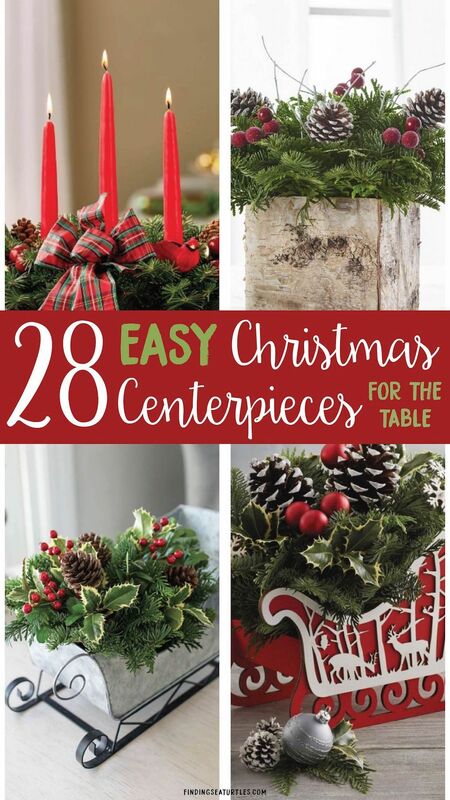 We all love to create our own Christmas centerpieces. But sometimes, there isn’t enough time in the day to get everything done. We shuttling the kids to school and events. Other days, we work extra hours. There is little time left for DIY projects. If you find yourself short on time, take a look at these gems. 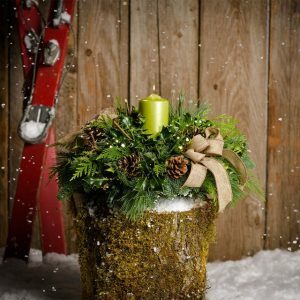 Beautifully created Christmas centerpieces to Welcome your House Guests. 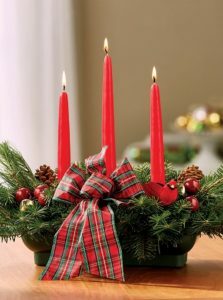 Christmas centerpieces to light up Christmas family dinners, parties, and all the festivities of the season. Take a look at these stunning Christmas centerpieces. Perfect for yourself or as a gift for someone on your shopping list. Be sure to tell us what you think in the comments below. Enjoy these spectacular Christmas centerpieces! 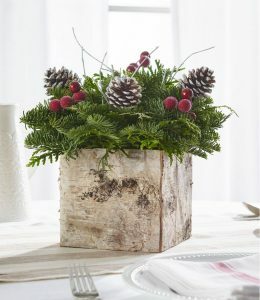 A fresh from the forest Birch Box Centerpiece is a perfect companion for holiday gatherings. A convenient size of 9 inches tall and 10 inches wide centerpiece. The Birch Box features evergreens of noble fir and western red cedar with faux frosted red berries. Accented with white tipped cones and white twigs, the Birch Box has a natural birch wood base. 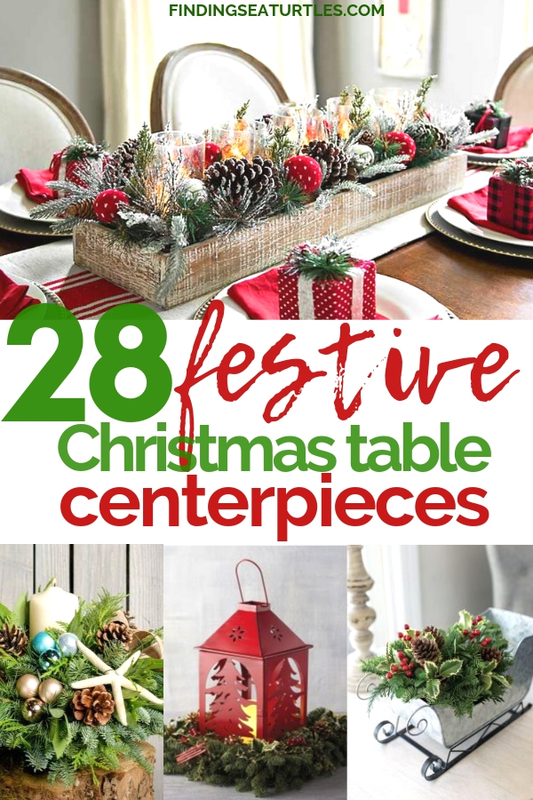 Deck your Christmas dinner table with this festive centerpiece! 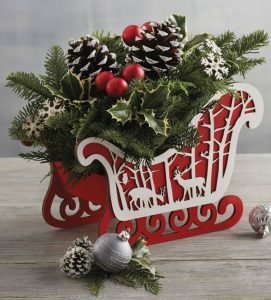 Dash through the snow to this bright Red Sleigh Centerpiece. A great woodland scene, the Red Sleigh is filled with noble fir, western red cedar, and variegated holly evergreens. Accented by snowflakes, red ornaments, and painted ponderosa pine cones. The Red Sleigh makes it all Merry and Bright! Sure to be a big hit with the younger crowd as well as the not-so-young crowd too. 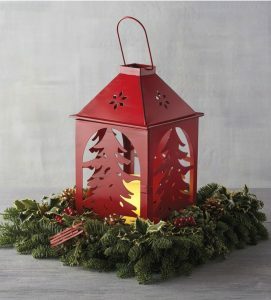 This gorgeous festive red lantern is adorn with noble fir, Western red cedar, Oregon blueberries, juniper, and variegated holly. Accenting the Holiday Lantern Centerpiece are golden pine cones and red berries. With its LED candle glow, the Holiday Lantern adds a traditional look to your holiday gathering. Included with the Holiday Lantern, is a remote for easy power on and off. Elegant and festive Christmas cheer this season! A rustic and stylish bark basket full of freshly harvested greenery, Canella Berry Table Basket is stunning. Filled with noble fir, incense cedar, and berried juniper, the Canella Berry Table Basket has a tangy scent. Accented with red berries and ponderosa pine cones. A perfect choice for an entryway or dinner table. The Canella Berry Basket is 12 inches wide, 12 inches tall, and 18 inches long. Nostalgic village structures, the Concordville Zinc General Store adds a lovely farmhouse decor to your home. Perfect for your mantel or dinner table. 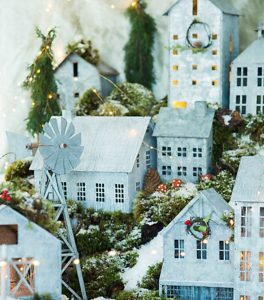 Add some micro lights to the General Store along with a few bottle brush trees. The General Store is 10 ¾ tall, 7 inches wide, and 4.5 deep. There are many Concordville Zinc pieces to collect over the years. With its Scottish Highland Bow and candles, the Balsam Centerpiece adds elegance to any decor. Accented with faux red crab apples, jingle bells, and three red tapers. 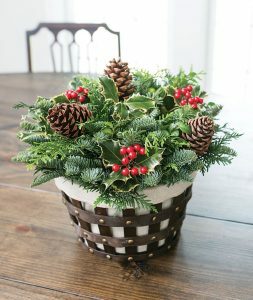 The Balsam Centerpiece has fresh evergreens of white pine and cedar greens. A great dinner centerpiece for family gatherings. Made with fresh noble fir evergreens, holly, cypress, and boxwood the Home for Christmas Sleigh adds a nostalgic touch. Nestled in a galvanized metal sleigh, the Home for Christmas centerpiece delivers Christmas magic to your table. 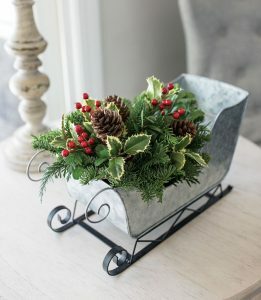 At season’s end, repurpose the metal sleigh for other holiday decor projects for years to come. The centerpiece is 9 inches wide, 6 inches tall, and 13 inches in length. 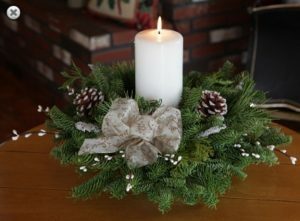 Beautiful and fragrant, A Bounty of Boughs Centerpiece has fresh evergreens. In a gold studded slatted basket, A Bounty of Boughs is lined in muslin. The basket is reusable after the holiday season. The centerpiece, Bounty of Boughs measures 12 inches wide and 10 inches high. 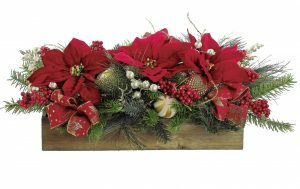 Bring on the holiday spirit with the Holiday Woodland Evergreens Centerpiece. Made of noble fir, white pine, boxwood, cedar, salal, ponderosa pine cones and red canella berries. Includes two red taper candles, the Holiday Woodland is about 26 to 28 inches in length. An elegant, fresh scented S-shaped centerpiece to adorn your holiday table. A selection of noble fir, incense cedar, and white pine give the Vintage Silver centerpiece its natural beauty. 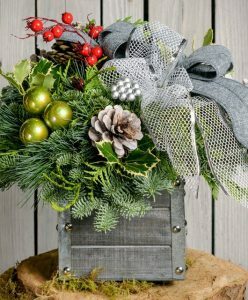 Metal accents fill a grey wooden box along with holly, pine cones, silver and red berries. Measuring 15 inches wide, 15 inches deep, and 12 inches tall. The Vintage Silver is a stunning display of lush Christmas greenery. Features both a charcoal linen and silver netting bow, the Vintage Silver centerpiece delivers warm Christmas cheer. Celebrate the Winter season with the naturally elegant Lime Light centerpiece. 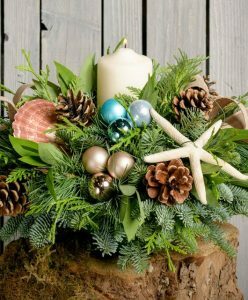 Evergreens of noble fir, pine, cedar, and holly fill this centerpiece. A lime green pillar, green ornaments, and a gorgeous burlap bow adds to the festive woodland look. Measuring 12 inches by 12 inches, deck the halls with this Lime Light gem. Two golden taper candles brighten up the Golden Magnolia Taper Candle Centerpiece. Beautiful Magnolia leaves, golden globes, pine cones, noble fir, incense cedar, and pine for tabletop elegance. The festive Golden Magnolia centerpiece is 18 inches wide, 14 inches deep, and 9 inches tall. A magnificent centerpiece, the Golden Magnolia is a perfect gift or treating yourself! Made of noble fir, white pine, incense cedar with pine cones is inspired by the outdoors. The 14 inch centerpiece, Hunter’s Hollow has a chickadee and bird’s nest. A tin dish wrapped in real birch bark, fragrant Hunter’s Hollow has Spanish moss, faux berries and twigs. A beautiful centerpiece that reminds one of the natural beauty of the woods, the Hunter’s Hollow centerpiece. Northern forests beauty is displayed in the natural birch bundle of Fireside Birch. 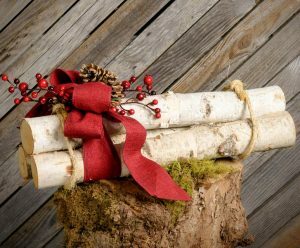 Three logs roped and adorned with faux red berry branches makes this centerpiece a classic. Adorned with faux red berry branches, pine cones, and a deep red brushed-linen bow. Great for mantels, fireplaces, entryway or a tabletop piece. Measures 18 inches in length, the Fireside Birch makes you want to curl up by a warm, glowing fire. 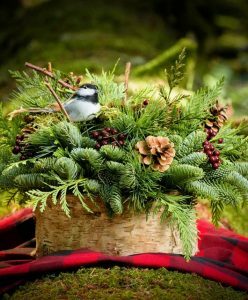 Holiday splendor is on displayed with a snuggling chickadee bird on a bed of fragrant evergreens. Made of noble fir, white pine, and incense cedar, the Noble Nest rests on top of a birdhouse. Accented with pine cones, blue ball clusters, bird nest, and Spanish moss. Topped with a linen bow. The Noble Nest measures 12 inches wide, 10 inches deep, and 11 inches tall. 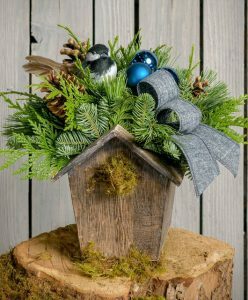 The rustic birdhouse will warm the hearts of all your Holiday house guests! Dreaming of white sandy beaches? Bring the beach to your home with this Nautical Centerpiece. Made with a seashell, sand dollar, aqua and champagne ball clusters with a white pillar candle centered. Fragrant evergreens include noble fir, white pine, incense cedar, and bay leaves. Measuring 18 inches wide, 14 inches deep, and 9 inches tall. All accented with a tan linen bow, the Nautical Centerpiece is a fantastic gift for beach loving families. Made of Maine balsam, native pine and cedar, the Winter Elegance Pillar Candle Centerpiece is stunning. With real pine cones, ivory faux berries, and faux icicle branches, Winter Elegance has a white pillar candle. Measures between 12 and 14 inches in diameter. Made of Maine balsam and white pine, the Classic 5 Candle Centerpiece has pine cones, and faux holly berries. Includes two 8 inch, two 10 inch, and one 12 inch candles. Topped with a red velveteen bow. Made in Maine, the Centerpiece measures 27 inches long and 13 inches wide. 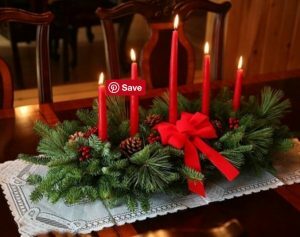 Note: The Classic 5 Candle Centerpiece is made by Worcester Wreath Company. Worcester Wreath Company is owned by Morrill Worcester, Founder of Wreaths Across America, and his wife Karen Worcester. Click here to read about Wreaths Across America. In an antique gold finish, the Pomeroy Heartland Lighting Bar Candle Holder has Christmas accents. Measures a little over 8 inches in length. Made of metal, glass, and iron. The Lighting Bar holds 3 votive candles perfect for Christmas get togethers. Adorn with poinsettias, berries, and shiny baubles, the National Tree Company Christmas Candlestick is the ideal centerpiece. 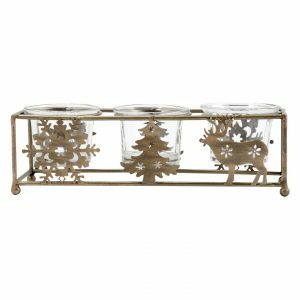 A metal base features three pillar-sized candle holders. 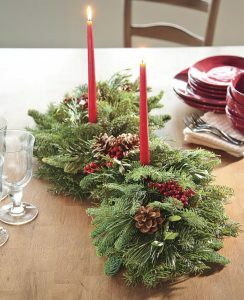 The Christmas Candlestick has faux greenery and makes a great tabletop decor. Measures at 28 inches wide, 12 inches deep, and 4.75 inches in height. The perfect size for intimate holiday gatherings. With a single glass hurricane holder the Gold Glitter Ornament Centerpiece is the perfect piece for small spaces. Measures 16 inches in diameter and 6 inches tall. 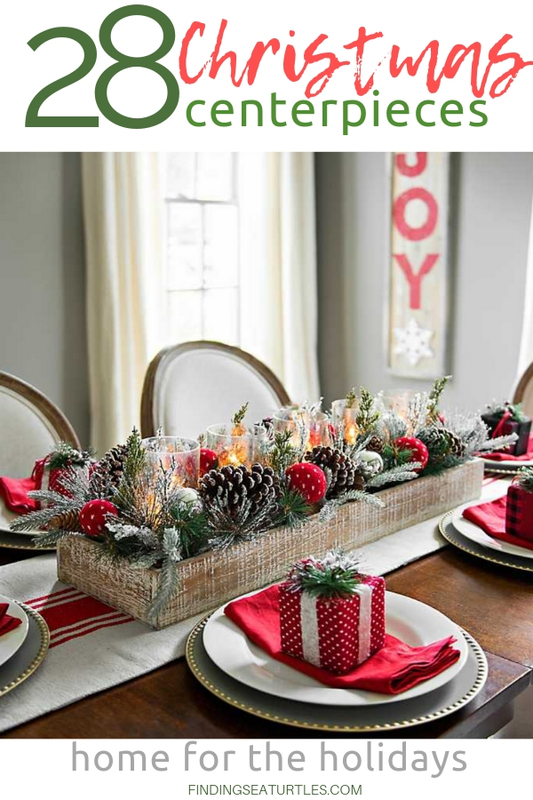 The Gold Glitter centerpiece has faux green pine needles, pine cones, and red berries. The indoor Gold Glitter piece is attractive for use on a mantle, dining table, or entryway. A handcrafted wood and metal lantern that creates a snowy scene. 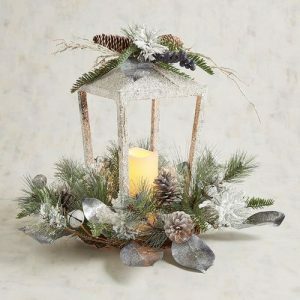 The White & Silver Lantern with LED Flameless Candle is covered in natural pinecones and twigs. Snow covered faux evergreens with silver bells creates the perfect New England snowy look. Or maybe a scene right out of Charles Dickens’ A Christmas Carol. The White & Silver Lantern with LED Flameless Candle resembles a street gas light that was common in years past. Dimensions are 17 inches wide, 17 inches deep and 16 inches in height. 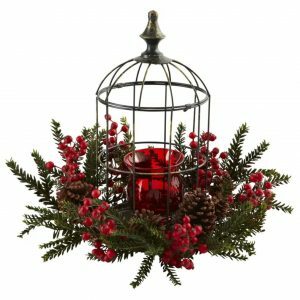 A holiday decoration for lighting up the candle, the Pine Berry Birdhouse Candelabrum is stunning. A deep red candelabrum surrounded by pine berried, sprigs, and pinecones. An excellent gift or for use at your own home, Pine Berry Birdhouse will remain a treasured decoration. Poinsettia Pine and Pine Cone Candelabrum has a glass candle holder with metal handle for a rustic farmhouse look. 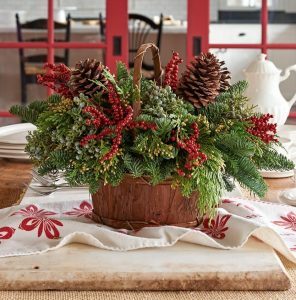 Big beautiful Poinsettias, wispy Pine, and Pine Cones makes this centerpiece a favorite. Bright, cheerful, and perfect for tabletop decorating. Faux flowers of bright red poinsettias, red berries, pearl berries, gold & cream ornaments in a wooden crate. 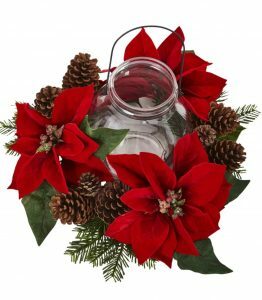 A Holiday Ball Ornament Poinsettia Centerpiece that delivers festive cheer right to your home. Dimensions are 24 inches in length, 10 inches width, and 10 inches tall – just the right size! Topping off the Holiday Centerpiece, is a bright red and gold glitter ribbon. 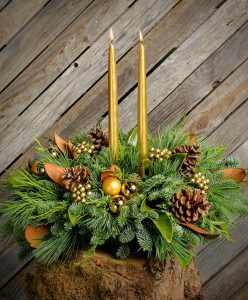 Holiday Mixed Faux Greenery Centerpiece with Candle Holders has pine, cedar, yew, magnolia leaves, green berries with pine cones. 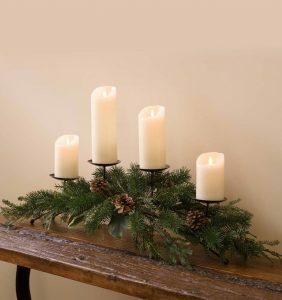 Over an arched black metal frame with four candle holders, the Holiday Centerpiece is perfect for holiday entertaining. For indoor or sheltered area use, dimensions are 37 inches length, 7 ¾ inches width and 9 ¾ inch height. Need a little Christmas, this season? 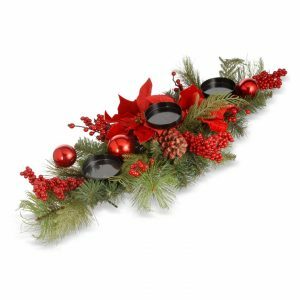 Well the Pine & Swiss Dot Ornament Centerpiece can deliver a little Christmas to you! Snow covered pine cones, red with silver polka dot ornaments, and five glass hurricanes for candle placement. A generous size centerpiece of 36 inches in length, 9 inches width and 10 inches tall. A great addition to a farmhouse decor style home. 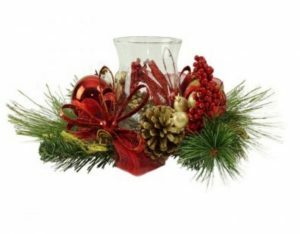 The Pine & Swiss Dot Ornament Centerpiece will look spectacular during your holiday gatherings. Festive fun for the little ones with this adorable Pine & Snowman Head Floral Arrangement. 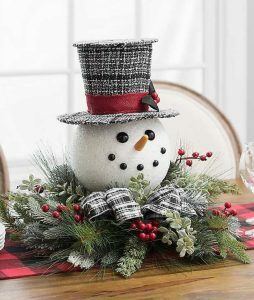 With its plaid top hat and plaid bow, this Snowman looks handsome in its decor. Dimensions are 20 inches long, 20 inches wide, and 17 inches tall. Faux pine and red berries accent the Pine and charming Snowman centerpiece for a delightful Christmas display. 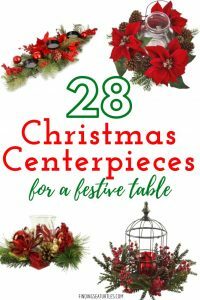 Whether you’re looking for Christmas Centerpieces for yourself or as a gift, these centerpieces look fabulous in any home. These are 28 Christmas Centerpieces to welcome house guests when you are short on time. Spend time with family and friends. Save time with one of these centerpieces. Create a holiday favorite with one of these centerpieces. 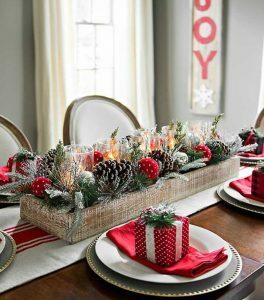 These Christmas centerpieces are versatile and can create the right mood at your dinner table, a mantle or a Christmas vignette. Add instant holiday decor to your home throughout the Holidays. A great gift for plant lovers and home decor lovers. A real show stealer! If you have a favorite Christmas centerpieces let us know. Consider sharing your holiday look with us. 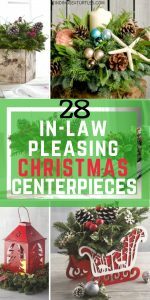 And if you try any of these Christmas Centerpieces, let us know how you make out in the comments below! Thanks for visiting.